With a name like Epoxyshield, you can already guess what this product does best. It’s a clear epoxy that has been designed to invisibly protect the surface you have underneath it. This could be a fresh and pristine concrete floor, a colored epoxy, or even a fancy glitter or penny floor project. Whatever your reason for needing a clear epoxy, this is one of the better ones (because it’s made by Rust-Oleum who are the big dogs of the floor coating world). Today we are going to look at why we love this product so much in our Epoxyshield Premium Clear Coating Kit Clear Gloss review. This might sound like a silly section to have on a totally colorless and transparent product. But there is more variation between the appearance of clear coats than you might think. Some of them are cloudy, others are patchy, and some are just downright terrible. However, this is a Rust-Oleum product – which means it’s awesome. It cures perfectly with no visible patches or haze. It looks like a perfectly level layer of invisible glossy goodness has been applied to your floor by a professional. If your project demands a clear coat of the highest quality – you’re not going to be disappointed. This is an exceptionally durable clear coat. It’s been designed to protect surfaces that are fresh and beautiful. So any kind of weakness was simply not an option for Rust-Oleum when they formulated the compounds that make up this product. Like any good epoxy coating, it’s super resistant to heat, cold, hot tires, water, some acids, oil, antifreeze and all other kinds of chemicals one might find in their garage. However, despite it being strong, you do need to take care of it a little bit. Spills should be cleaned up as soon as possible (it’s not an emergency if you spill something, but don’t leave it there for days). If you don’t do this, the clear coat can degrade and become cloudy or hazy. It’s super strong physically, and unless you start dropping anvils on it repeatedly it’s going to hold up to pretty much anything the average garage can throw at it. Cracks, scrapes, and scratches are basically unheard of with this product. We love how Rust-Oleum decided to add an anti slip formula in this clear coat. This is something you don’t see in every epoxy kit (they are even missing in some of Rust-Oleum’s other offerings). However, their inclusion should be mandatory our opinion. When epoxy floors get wet they can get slippy, which is obviously very dangerous considering how hard the floor is. This is a simple single coat kit that even a total novice will be able to apply to a near professional standard. It’s self-levelling and a 2 car garage shouldn’t take you more than a day. 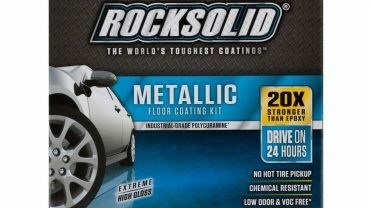 The kit contains enough epoxy to cover a single car garage that has bare concrete floors. If your garage already has an epoxy coating on it, there is enough epoxy in the kit to cover a two car garage. Curing times are quick, and you can walk on the floor after 24 hours without a care in the world (wait 72 hours before you drive on it). To be honest here are cheaper clear coats on the market that do a perfectly fine job. But if you have spent a lot of time and money on getting your existing floor nice enough to need clear coating – you probably shouldn’t really skimp on it. Because you have already found the right product.